To get in the mood for the Amsterdam Dance Event the Netherlands based Apollo Vredestein released a new music track, ‘United We Are – Vredestein Remix’, created together with the world’s number one DJ Hardwell and racing driver Carmen Jorda. Music has the power to affect moods and a majority of car drivers enjoying their selection of music when on the road. ‘The United We Are – Vredestein Remix’ track is to celebrate the moment of people driving and listening to their favourite music. The track captures the performance of Vredestein tyres in a unique way – the dance music track and video has been inspired by data from Vredestein tyres in action. The media campaign is in association with the Dutch DJ Hardwell, twice voted world's #1 DJ, and Spanish racing driver, Carmen Jorda. The inspiration for both the music and the video came from the thrill of combining dynamic driving and DJ Hardwell’s exciting music. “Music is the essence of a great driving experience. 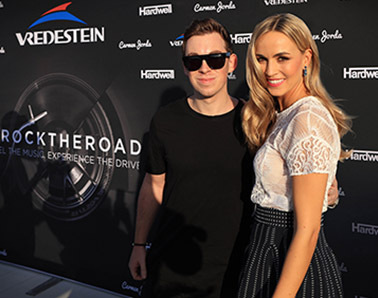 The creation of music from the data of the Vredestein tyres is a pioneering effort and will further enhance the connect between driving and music”, says Hardwell, one of the new generations of Dutch DJs who has conquered the club world of late. With 70%, of the over 12.5 million fan following of the two brand ambassadors being in the target group, the Dutch and Spanish stars fit Vredestein’s strategy very well to reach out to people who love their cars and enjoy driving. In addition to the music video, the campaign will showcase the ‘Making of’ movie. This explains how ‘United We Are – Vredestein Remix’ was formed with data from Vredestein tyres on the road. In November, the #ROCKTHEROAD campaign will launch a music mixer tool where fans and followers can try their hand at making their very own version of the tune. All submissions will be evaluated by DJ Hardwell’s team. The best three remixes would be awarded and shared on Vredestein’s online media outlets.